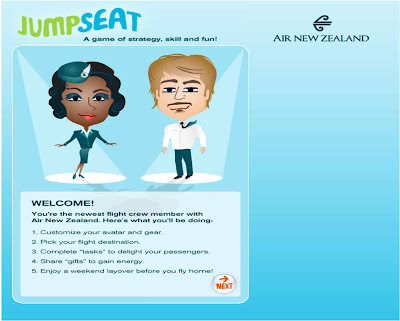 With 'Jump Seat', Facebook users are able to be in charge of their own (virtual) flight and jet off to a variety of destinations - with various different adventures and missions to be completed on the way. Jump Seat players can also upload pictures to create their very own avatars as Air New Zealand Flight Attendants or First Officers. Once en route, players answer trivia questions, play mini games and complete onboard tasks. Each completed task or correct answer is rewarded with energy points - the faster the response, the more points, which unlocks new levels of the game. 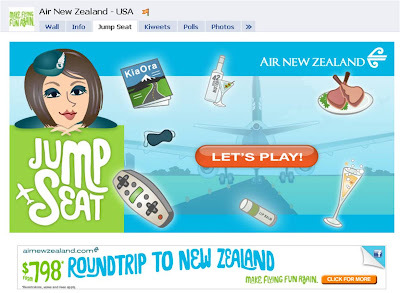 Game players are also able to recruit Facebook friends to help fluff pillows for the lie-flat beds, recommend and refill New Zealand wine, send fellow flight attendants gifts of energy points for a boost and tag team on tasks. As with the IKEA example I posted yesterday - instead of getting people to look at a standard banner, this sort of mechanic sees Facebook users personally promoting Air New Zealand. May not get as many impressions as a straight banner campaign, but the engagement / quality of interaction of those who do participate will invariably be higher. A nice way of bringing the Air New Zealand in flight experience to life.